Many of the benefits you take for granted today have been hard won by the efforts of those members who have gone before. You don’t enjoy the rights and conditions that you do because employers have just handed them out or because governments just decided to make laws to help working people. You enjoy these rights and conditions because workers acting collectively through their Unions have campaigned and struggled for them. Unions. The strength of a Union lies in its membership so it is vital that all those who benefit pay their way and belong to the Union. 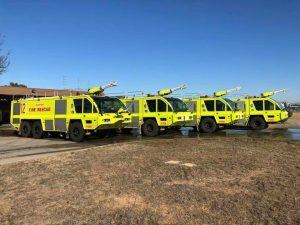 The Aviation Branch was successful in gaining support for a “disallowance” motion in the Australian Senate which maintained Airservices Australia as the sole provider of aviation rescue and firefighting services in Australia preserving jobs and career opportunities for Aviation Firefighters. A significant benefit won by the Union and often overlooked by members is the composite wage. It is significant because when you are on sick leave and some other forms of leave, you do not lose pay. You are not paid on a lower “base” rate of pay which would see your pay otherwise reduced by well in excess of 30% percent. Additional hours payments are also paid on your composite rate and not on a lower “base” rate of pay. The 2013-2017 Enterprise Agreement provides for an average annual increase in remuneration of 4.585% over the life of the Agreement after taking into account the increased superannuation contributions. The average annual wage increase over the life of the Agreement is 4.21%. Other state Fire Services and public service groups are averaging 2% to 2.5%, often with cuts in conditions. In Queensland, firefigihters were recently awarded a pay increase of just 2.2%. In NSW, firefighters were awarded wage increases of 2.5% in arbitration and with a loss of conditions. Through a national campaign in which the Aviation Branch was prominent, Aviation Firefighters, together with ACT Firefighters, were the first Firefighters in Australia to be covered by what is referred to as “presumptive legislation.” This means that if you contract a cancer specified in the legislation it is deemed to be occupational and you are automatically compensated. No fighting the employer or Comcare to establish that your injury is work related; it is automatically accepted as being a result of your occupation. Health and Safety in the workplace is of particular significance for Firefighters and this is one area where Unions have been very successful in securing laws giving significant recognition to the rights of workers to be represented in the workplace through Health and Safety Representatives. Also, employers are required to properly consult with workers through their HSRs on any matters affecting their health and safety at work. Your HSRs are legally entitled to monitor health and safety at work and hold your employer to their obligations under WHS law. Unions collectively and individually support education and training for workers including ‘on the job’ training. The training you receive today is a result of not only the collective action of Unions but also the UFU of A, representing all professional firefighters across the country, including ARFF firefighters, campaigning for and winning the right to access accredited, nationally recognised training. Having access to this has significant benefits for your career advancement as well as your career opportunities across all professional fire services in Australia. As a Branch of the UFU of Australia, the Aviation Branch is affiliated with the ACTU (Australian Council of Trade Unions) providing access to its resources and support in protecting and promoting the interests of our members. The UFU of Australia is a founding member of the International Firefighter Unions Alliance (IUFFA) and our affiliation with the UFU of Australia means the Aviation Branch keeps abreast of international issues and trends in firefighting. In more recent times, the Aviation Branch was successful in winning employer superannuation contributions of 12.5% for Aviation Firefighters. At the time this was 3.5% above the legislated Superannuation Guarantee Levy [SGL]. In 2012, the federal government legislated for an increase, from 1 July 2013, in the Superannuation Guarantee Levy from 9% to 12% by 2019. This increase would not have automatically flowed to Aviation Firefighters because Airservices was already paying above the SGL. However, your Union, the UFU of A Aviation Branch, was successful in securing the same 3% increase in the contribution Airservices pay to your superannuation accounts meaning that by 2019 employer contributions for Aviation Firefighters will be 15.5% and still 3.5% above the SGL. Unions fought for and won the right for Unions, to be consulted on issues affecting their membership. The Union regularly makes a difference on issues through the consultative provisions of the Enterprise Agreement. Through your Branch Committee Delegates and Organisers, your views and opinions are taken into account and represented to the employer through the Union’s participation on various consultative forums including the National and Divisional Consultative Councils. The Union is actively representing members interests in a number of matters including Station Design, replacement gloves, driver training, replacement fire vehicles, to name a few. Of particular significance are the improvements the Union has achieved in health and safety procedures and protocols associated with Compartment Fire Behaviour Training. This work is not finished and will be continued through the Unions representation on the joint working group established in 2012 as a direct result of the Union’s intervention and representations on the matter. Generally, the Union insists on being consulted on anything that affects our members in the workplace. Your membership of the Aviation Branch allows you to rest confident in the knowledge that at any time you need advice and assistance the Union is there. Members are given support and assistance with advocacy with grievances, disciplinary and other workplace issues. In the first instance your Organiser and Branch Committee of Management delegates are there on the job for you. The Branch Secretary is there to assist if help is needed at a higher level. You can feel comfortable that you can contact the Union without fear of any adverse action by the employer and that your privacy and confidentiality will be respected. As a member you also have access to the Union’s legal service which gives you an initial consultation free of charge. This service is open to all members and allows members to get advice on any legal matter and includes a free standard will online service. Contact the office for a referral. Legal assistance beyond the initial consultation is provided at a reduced rate. Through “ACTU member connect” members have access to a range of services available exclusively to Union members. Member Connect is 100% union owned by 16 unions, one of those being the United Firefighters of Australia. As a branch of the UFU of A, Aviation Branch members have access to these exclusive services including banking, automotive, shopping, insurance, financial planning, superannuation, home loans, movies, credit cards and car rental as examples. Additionally, the Aviation Branch is affiliated to the “Union Shopper”. The Union Shopper gives members access to a range of discount buying services. Members savings are significant. For example, a member recently bought a new car with a saving of around $3000. Discounts apply on white goods, cars, computers, cameras, travel, insurance and much more. Each and every Aviation Firefighter benefits from the efforts and achievements of the Aviation Branch and more broadly as a Branch member of the UFU of Australia. It is only fair and reasonable that all those who benefit should join the Union and pay their fair share. A Union cannot survive and operate effectively without the participation and financial support of those who share in the benefits of the Union’s achievements. It doesn’t cost to belong – It pays.